My brain today felt a bit like an empty train: speeding along without actually getting anyone anywhere. For all of the lovely ideas I’ve got, sometimes the rest of me isn’t really on board. It seems sometimes that the Lord gave me a quick, creative mind, but the world stole my heart. So I’m asking God for a new heart, and the will to make my 2013 resolutions work. Ethan, being my little tech, thought of another kind of resolution: it determines how much you can see, and how clearly you see it. Maybe I should see New Year’s resolutions less as a bucket list, and more as a means to see the big picture clearly and a way to solve problems. In fact, it seems those are the only types of resolutions that really worked for me in 2012. I didn’t blog it here, but my goal last year was to stop thinking of fitness in terms of body composition and more in terms of what I do. I wanted to do this by a) learning to dance and b) hiking more. Sadly, I’ve gained back almost everything I’d lost in 2010-2011. But I feel better. While trying to button some too tight jeans, I exclaimed, “Do you remember when these pants were loose? !” Responded Miss Mary: “Yup. Do you remember when you were too weak to dance or hike or even carry in the groceries? Because I sure do.” Touché. So I’m not entirely off the body composition bandwagon, but I have convinced my girl that ability matters more. I also think my actual body composition would have been fine had I been more consistent with my other resolutions. I didn’t hike much, and I did not dance every week, either. But for the first time in my life, I really did learn how to dance. Problem => Specific Action => Result. Problem: I don’t like Walmart, but I still go sometimes. I could talk about how their policies affect small businesses, communities, the nation, and the world, but I’ll say this: it has an effect on me. It makes me greedy. It makes me buy junk I don’t need. I don’t like that. Resolution: Put my money where my mouth is. Last year I spent $1468 at Walmart. This year, I’ll cut that in half or more. I’ll also take $734 and use it for charities or service projects that affect local communities, the nation, and the world. Problem: I’m overweight and not happy about it. Resolution: This time, put my mouth where my money is. My fast food spending for 2012 totals just about $480. I’ll cut that in half, too. Also, the kids and I are striving to live by a new rule: we’re done eating by eight (“Ate by 8”) except on holidays. No more dinners at 9 or late-night treats. We’ve been test-driving this resolution. It feels AWESOME. Problem: I’m still afraid to swim. I used to love it, but haven’t swam regularly since I was pregnant with Ethan. Consequently, the kids don’t swim either. All this makes for awkwardness at summer parties and scouts. Resolution: $240 I could have spent on fast food goes toward swimming lessons. We’ll work on our own, then hire an instructor for some private lessons in April. Problem: Politics. Current political discussions seem to create more problems than they solve. I always wish people would took a moment to understand our problems and our history, we could solve more problems. My problem? I don’t understand nearly enough myself. I’m terrible at history, worse at debate, and I’ve never even read the constitution. Resolution: Read the constitution by Presidents’ Day. Read it again by July 4th with my kids. Also: know the Logical Fallacies (I’m getting a poster, even!) so we can avoid being fooled or fooling ourselves. Problem: I feel frumpy. Since I starting working with Automattic, I don’t get out much. I wear scrubs that were once way too big. I love not worrying about appearance. I do think makeup for the most part is bunk. But if there were a spectrum between vanity and slop, most days I’ve fallen off the latter end. I clean up for special occasions, but I know I’m not taking good care of myself. Part of that is due to some super crappy dating stuff I dealt with in 2012. I don’t need a to-do list or a beauty routine. I need an attitude adjustment. Resolution: Be my best me, for me. Get ready for each day like I’m gonna spend it with someone I love, because I should love myself. Also: FIND A GOOD THERAPIST. Seriously I’d recommend that to anyone. Problem: I’m not where I want to be spiritually. Resolution: God’s gonna have to fix this one, but I’ll do my best to help. I have four devotional workshop packets (Thanks Amy!) covering Meaningful Prayer, Studying the Scriptures, Fast Observance, and Temple Attendance. I’ll spend a month in each packet, then repeat. Also: Along the same lines for the kids, we’ll do the same thing with our cool new spiral-bound graphic novel versions of the scriptures (Thanks V! (Superfriend Steve’s mom)). One month on each book, repeated through the year. Physical (caring for my body) – Cut fast food by half; “ate by 8”, swimming before Summer. Mental (using my mind / talents) – Read the constitution by Presidents’ Day, then read it again by July 4th with my kids. Temporal (being grateful for my ‘stuff’ and using it wisely) – Cut Walmart & Fast Food spending in half. Social (loving others) – Find the best projects and charities for $ I would have spent at Walmart. Emotional (loving myself) – Be my best self, accept myself, and find a good therapist that will help me make some measurable progress. So. I’ve got a map of where I am now and where I want to be. As Dieter F. Uchtdorf put it in his last conference talk — “good intentions are not enough. We must do.” I must do. I must go. I must be. And with God’s help, I will. And you already know I’m a feminist. Yet my heart about broke when I heard of “Women Wear Pants to Church Day” because of all the animosity I knew it would create. I love my friends who are participating in this, though I disagree with the idea of “demonstrations” at church. I love my friends who have hard harsh words for these protestors, though I completely disagree with their tactics, too. What’s the problem with women wearing pants to church? Nothing. Nothing at all. The entire problem on both “sides” of this issue? It’s us. Us and our failure to love one another as the Lord loves us. I do believe with all my heart that church is the place to make social change. I know contention is not the way to go, Love is. So I’m asking you, whichever “side” you’re on, to remember to love. Remember that the Lord looks on the heart. Women who have long ago felt shunned are coming back for this. Please love them as your sisters. Please be aware of the example you set for your children or the children around you. Regardless of how you feel about the politics of it all, please, please make a point of demonstrating our love one to another. Ironically, the moment I typed that title, my brain started running in overtime trying to figure out how to say something awesome and useful and short and concise and life-altering here. Suffice it to say: the gospel of Christ is ALL about love — loving God, loving others, loving ourselves. That’s it. And we get in this trap of thinking that surely it’s got to be something more than that, right? Surely we’ve got to look high and low and find out the secret to it all. But the secret is that it’s not a secret at all. 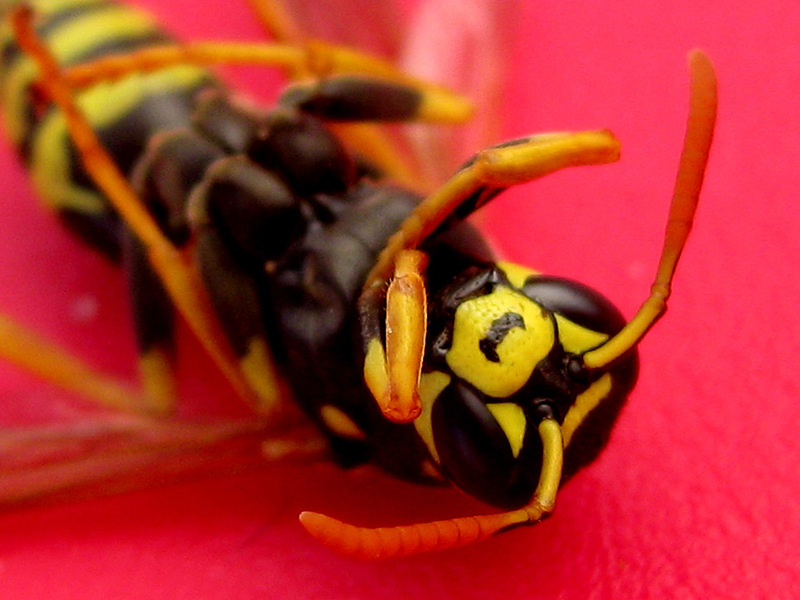 A wasp. Not a bee. Scary, but dead. He looks at peace. My son is a terribly logical kid, but no amount of reasoning seems to dissuade his fear of bees. He’ll stay inside all day just to avoid them. And sure, he goes out at night when the bees have all turned in, but usually his potential friends are gone by then, too. I happened to meet a beekeeper tonight and we talked about this very issue. He not only keeps bees, but he runs swarm removal service in Salt Lake City where he’ll catch bee swarms that might be bothering you. We both figured Ethan would get over his fear of bees once he’s been stung — but will that ever happen? I think if you were to ask Ethan what his goals this summer are, he would not say, “To avoid being stung.” And yet, at this rate, he’s very likely to meet that unspoken goal, even though it keeps him from doing what he’d enjoy. Would a good mom force him to get out and get stung so he can hurry and get over it? Am I doing the same thing in life? What are my goals? What is the Lord asking me to do that I might be afraid of, and am I living life as though my primary motivation is to avoid getting hurt? Richard E. Turley spoke at the fireside I attended tonight. He specifically requested that we sing hymn #240, a song about the principle of agency. And he spoke about how the Lord would bless the faithful. So what do I choose: fear, or faith? God isn’t going to force us to heaven, or to happiness. And it isn’t just a matter of WANTING happiness, either. We have to have faith and trust in Him that all will be well, and then act in accordance with that trust, knowing that God will keep His promises to use. It’s something to think about. Be kind and be grateful God is kind; it is a happy way to live. What was your favorite conference quote this time around? Are you kidding? Gift baskets full of conference ideas, tied with cute little cards? We did try the King Benjamin tent idea once or twice, but they were totally wild and didn’t listen at all. It turned into a “The tent is up to -help- you listen. If that isn’t working, it’s going down; no more tent.” And that was the end of the tent attempts. Ever since then, my kids get pancakes during the first session while we listen. We take notes in our journals. We can cuddle on the couch or do what a good friend suggested and put a special puzzle together. This year we might work on a collage, since I’m enjoying making those lately. Keeps our hands busy and our minds engaged without being too distracting. We take a walk between sessions, then enjoy soup and sandwiches while listening to the second session. We have some soft foam blocks (quiet) that they’ve built temples out of. That was another fun one. But I really haven’t gone out of my way to be anything but spiritually prepared. Maybe not even that. I’m OK with naps, and I’m OK with commentary about the talks. Overly simple? Maybe. I just hope they’re getting what they need out of it.